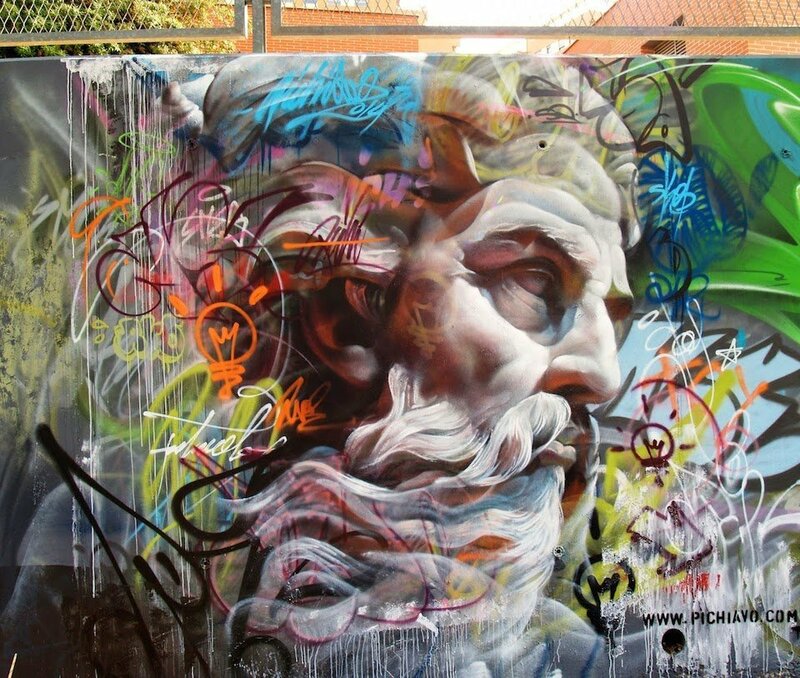 Street art in Spain by PichiAvo. "film curator, writer, lecturer, and paramedia ecologist has conducted interactive workshops from UCLA to MIT, from the Ann Arbor Film Festival to Culver City High School. Fialka gave two major lectures at The 2001 North America James Joyce Conference at UC Berkeley. His public interview series MESS (Media Ecology Soul Sessions), with the likes of Mike Kelley, Alexis Smith, Abraham Polonsky, Mary Woronov, Paul Krassner, Ann Magnuson, Heather Woodbury, Norman Klein, Chris Kraus, P. Adams Sitney, Hunter Drohojowska-Philp, Kristine McKenna, Ann Magnuson, John Sinclair, Grace Lee Boggs, Firesign Theatre's Phil Proctor, Van Dyke Parks, Orson Bean among many others, began in 1997 and continues at different LA venues including Beyond Baroque and the Canal Club. Fialka's interviews have been published in books by Mike Kelley and Sylvere Lotringer. His William Pope.L interview was published in ARTILLERY magazine."